La Scarpetta is a modern Italian restaurant located in Coulsdon. It offers a range of fresh, authentic Italian dishes which can be enjoyed as a light snack, lunch or dinner. 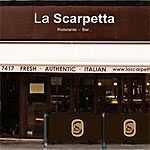 Do you work at La Scarpetta? What did you think of La Scarpetta?